We have Charizard and Ivysaur. I want an ultra beast. I just want something more different. Preferably not related to starters at all, and maybe some varied typings that haven't been in Smash yet. We have enough general fire in Smash to where that's not a type I'm really interested in seeing explored further, but if I had to pick it'd be something like Alolan Marowak. It's a very different type of fire aesthetically and it could focus on the ghost typing and signature stuff like Shadow Bone and Bonemarang. Similarly for water I'm a fan of the Golisopod idea, throwing in the bug typing and an aesthetic not purely based around water, plus moves like First Impression. There's not a lot of viable Gen 7 grass with varied typings; I think the best bet is Dhelmise with the ghost typing but also the steel characteristics. I guess you go for grass/fairy with Tapu Bulu, or a combo that doesn't introduce a new-to-Smash type like Kartana's grass/steel. If Tapu Bulu makes it to Smash before Whimsicott I will scream. Golisopod would be great. Other things I'd enjoy seeing are ghosts in general (Gengar for example), Gardevoir, or things like Eevee where you have a base moveset and at a certain point in the battle you have to commit to a playstyle and evolve accordingly. See, I'd like Marowak (Alolan version) or Golispod, or Tapu Koko over anyone already in Pokken. I'm going with Pheromosa/Buzzwhole because they feel like something Sakurai would go for. Well, that Gengar rumor managed to shaken my "no more gen1" core tenant. Last edited by MetaMario; October 9th, 2018 at 05:08 AM. Reason: decidueye? (brings out the spreadsheet with franchises and songs to calculate how many are left, and how does this affects everything) huh. Well, you see the first letter of each song spells out a message that says "mvbbncss" meaning: there are no more characters in Latin. etc, etc. Definitely more than most series but not *the* highest. Castlevania has what, 30 odd confirmed tracks this time around? Really interested in seeing the selections from each series. Granted a lot of them will be tracks from across Smash, but a lot of the newer remixes have stuck out to me. Speaking as a Fire Emblem fan, I think the Heroes remix was catchier than this new one and even then, a little weak compared to F-Zero, Brinstar Depths, Steven, etc. I might be the only one who dont like Id. That and Don't Speak Her Name. Greninja's final smash has been changed. It now involves transformation to Ash-Greninja. 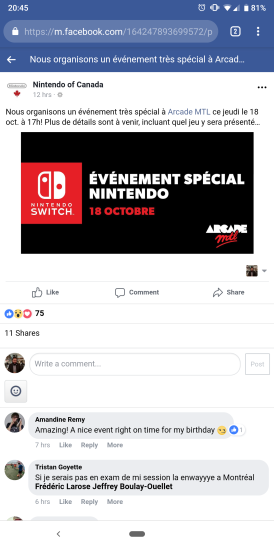 Nintendo of Canada on facebook made a post saying "Come to Arcada MTL, the bar, in Montreal on 10.18 for a very special event." 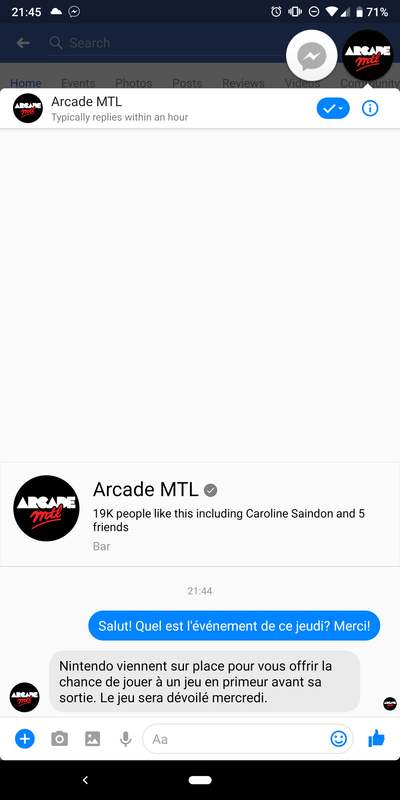 Nobody can see the post outside of people living in Quebec. Additionally, the post says they can't say what the game is until Wednesday. Someone DM'd the bar. The bar told him that even THEY don't know what the game is, Nintendo wont' tell them. It's a complete surprise. Nintendo is being secretive, oddly, so it would be weird if it was for something such as Pokemon Let's Go, though there is a chance that it could be possibly anything. There's not much else reason to be this secretive, or else the bar would know already, they don't even know themselves. A post was also added on the bars page saying "3 days remain"
I think that on wednesday a direct will be announced and this viewing party will be watching it. It will be Mario Hockey only. 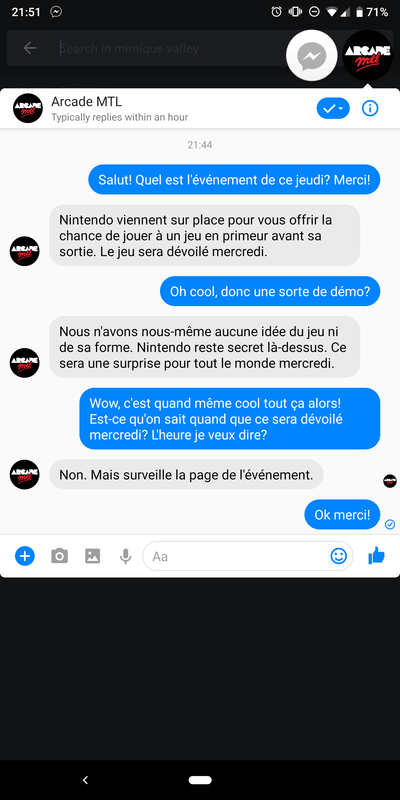 PushDustin (Source Gaming user) confirmed Nintendo gave Crunchii permission to upload it. I want some news. I'm like here, refreshing the page obsesivelly and nothing.-. October 18th is just tomorrow, no? I really doubt that we will get something out of a random canadian thing. The Canadian thing was just saying it's bringing demo booths to the place in question. Still a little odd though that they would be secretive about the demo.